David Foley can now add Hall of Famer to his list of achievements. He is the first soccer athlete to be inducted into the New Brunswick Sports Hall of Fame. Mr. Foley played four seasons with the Varsity Reds men’s soccer team starting in 1983, and then 1985 to 1987. In 1984, a pair of significant ankle injuries cost Mr. Foley the equivalent of an entire season. He finished his four seasons at UNB as the all-time leading goal scorer, in men’s soccer. His 30 goals tie him for 17th on the Atlantic University Sport career goal-scoring list. Twice he was named to the Atlantic Conference all-star team and twice he was named a Canadian Interuniversity Athletic Union all-star. He helped UNB win Atlantic Conference championships in 1986 and 1987. Both those years, the team advanced to the CIAU semi-finals. “I couldn’t be more thankful for the support from coaches and teammates throughout my career. From UNB academics to varsity soccer it was a great experience,” says Mr. Foley. He graduated from UNB with a bachelor of physical education in 1987 and received his bachelor of education in 1988. His successful career did not stop after the Varsity Reds. 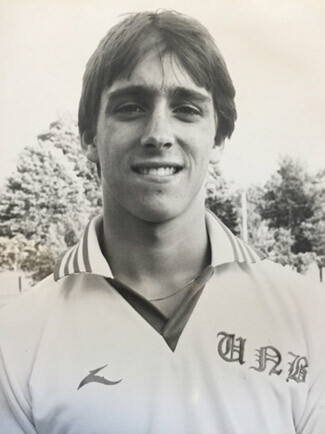 He went on to play as a professional soccer player for the Winnipeg Fury Soccer Club, where he was the franchise’s leading goal scorer when he retired in 1991. He now resides in Ottawa where he works as a sport physiotherapist. Mr. Foley officially joined the hall when it held its induction ceremony at Centre des congres de la Peninsule acadienne de Shippagan on June 4. His induction will bring the total number of honourees to 249.